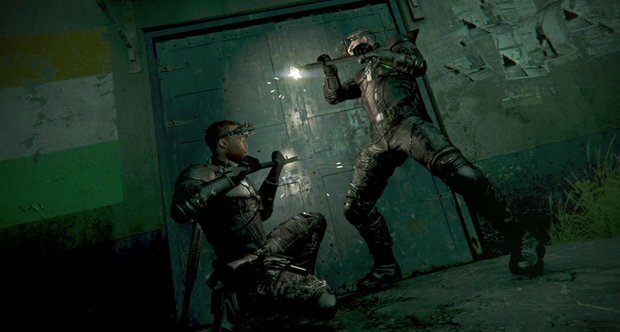 I’d heard plenty of belly-aching about how different Splinter Cell: Conviction was from the previous games. It was. And it’s always a risky endeavour to do something like that, but they nailed it. The series had become so bogged down in pointless chaff that while the core gameplay was a solid stealthier I had to wonder why I bothered since everything they added to the series did nothing to improve it (the exception being spy vs merc, of course.) Enter, Conviction. Conviction’s crowning achievement was to strip about all the crap. I mean, in previous titles, Double Agent and Chaos Theory, you had a silenced assault rifle, and a silenced pistol. Which meant you had fully 2 different ways to simply head-shot everyone on the level without raising an alarm. Oh? You wanted to do it non-lethally? Perhaps to make it a bit more of a challenge? No problem, you could literally shoot compressed air with enough force to knock guards out. Naturally, you could take everyone down with hand-to-hand (and I think this is what most people did) but that meant: pistol, air-ring, main gun, basically every single gadget… all useless. They even gave you the option of using a lethal knife or just non-lethal takedowns… which of course was a pointless decision. Double Agent and the knife. Does it actually have a point? So, Conviction cut through all of that like a laser. You could tear through the level like a thing of nightmares, disappearing dudes packs at a time. If someone stopped to ask, “Huh?” You’d use that as an opening to drop down from above and dispatch him too. Even Conviction struggled to truly make everything count, though. They gave you a wide variety of weapons and each of them could be upgraded with various mods… and the whole exercise was completely and utterly pointless. There was next to no point in ever upgrading your main gun, and all you were interested in was getting more “marks” for your pistol so you could use the awesome “Mark and Execute” better. So take that minor flaw of Conviction, and amplify it ten-fold. That’s Blacklist. I know why it’s happened: whingers. Those who were turned off Conviction’s focused gameplay because they were long time fans and who knew how to take a middling series and squeeze fun out of it. They didn’t like the idea of tight controls and clean gameplay. Now anyone can have fun! What’s that about? Case-in-point is the return of the knife. Like most things people whined about, it was an odd thing to request a return. The decision between lethal and non-lethal was always pointless, so Conviction simply took it away. Why not just combine the lethality of the knife into the default hand-to-hand strikes? It was gravy that Sam would throw in brutal point-blank-range pistol shots in his take-downs. Now, in Blacklist, the knife is back, and you can choose lethal or non-lethal. To their credit, they’ve tried to add a reason to use it. There are three ways get through a level: Ghost (non-lethal), Panther (lethal), Assault (You might as well play Gears of War.) There is a little bit of subtlety to each of the modes – for example Panther gives you bonus points for using Mark and Execute on as many people at a time as possible, whereas Ghost gives you bonus points for each guard that was completely undisturbed in a zone. It doesn’t quite work, though, because as a Panther I like killing guys, but if I have no need to kill them, shouldn’t I get a little bit of a kick-back for that? No? I guess our ideas of sneaking into an area (lethally) are different. Blacklist is for the most part still Conviction, it’s just a shame they didn’t improve on what made it so good, and instead opted to add as much chaff back in as possible (except, of course, spy vs merc which was never chaff.) Now you have tens of gadgets, which alternate between utterly useless (tear gas) and the completely game-breaking (tri-rotor.) The whole game has some real balance issues, actually. Now you can Mark and Execute just as well with any weapon as your pistol. Say hello to Mark and Execute from across the map with a silenced sniper rifle. To slow down your marks and executions “special” guards have been added in. Guys with helmets, for example. They can present an interesting challenge since a Mark and Execute that includes them will only make them angry – but include a co-op ally and now you can double tap him. Oh, except, the best sniper rifle (which you can get in the first 25% of the game) can just shoot through their helmet. Yay. You can still have a lot of fun by exercising a bit of self-control, though. (Similarly to Double Agent, I guess.) The co-op is just as much fun as it was in Conviction (although the story only gets interesting when it references Conviction) and it is worked into the single-player campaign quite cleverly. They also present 4 different co-op pseudo-campaigns: once again, Ghost, Panther, Assault, and this time also a story campaign that you’re not obligated to do in any particular style. Poor balance rears its head again, though: I usually complete the Ghost missions by just killing everyone. Since it’s supposed to be done “ghostly” there are less obstacles in your way and so it’s incredibly easy. Furthermore, you’re usually supposed to be sneaking in and bugging somewhere without them knowing… you’d think leaving a trail of bodies would be a giveaway, but nope. If you restrict your weapons, play the missions as they’re probably designed (rather than what is most effective) it works OK. It’s silly you have to self-censor yourself though. A lot could be said about Sam’s changed voice, too, but ultimately it’s not why you play so I won’t go on about it. The story-line is about on par with previous entries, but Sam’s voice is so bland it carries absolutely no weight. I cannot remember much of what happened in the previous entries – except Sam’s personal developments; I attribute this to Michael Ironsides superb voice acting. Compared to any other game voice actor out there, the new Sam does fine. Compared to Michael Ironsides it’s barely tolerable. If they were to change the actor for the next Splinter Cell, I doubt anyone would even notice, he is so bland. From everything I have heard, the new Spies vs Mercenaries mode is excellent. I know that played with and against friends I had a ball with the original games’ versus offering. I’m a little afraid to dip into this one though because experience counts for so much – knowing the map layout and map tricks, for example. I should try it out, but at the moment all I can tell you is that I’ve heard it’s pretty good. If you’re hankering for more Conviction action, like I was, I’d recommend grabbing Blacklist now. It’s fun, and still has much of what made Conviction great. If you’re pining for the good old Double Agent days, and hated Conviction, I’d steer clear (and therein is the irony, since Conviction’s style has been comprised to appease the haters, and it will not help to bring any in.) If you liked Conviction, but aren’t willing to put up with objectively worse gameplay, then wait until it’s on special. It’s worth checking it out, but few of us are used to paying full $70-$90 for a game nowadays, and it’s hard to recommend Blacklist at that price.